Commercial oven cleaners may be hazardous to people and the environment. These 7 ways to clean your oven will keep your oven clean while staying green. If you’ve ever used commercial oven cleaners, you’ve understood from the strong odor, stinging eyes and lengthy label precautions that the ingredients may be hazardous to people and to the environment. 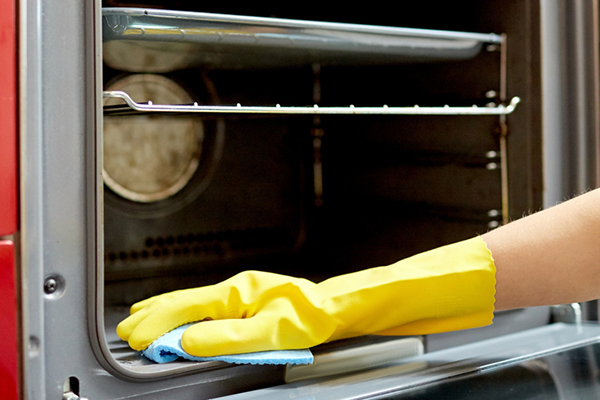 Fortunately, oven cleaning doesn’t have to be unpleasant for you or for the ozone layer. There are many non-toxic oven cleaning alternatives that use ingredients you may already have and that can even cost you less in the long run. That’s why we reached out to Lindsey from Hello Natural for special tips. • Pass the salt. If you have an oven spill, wait until the oven cools and then sprinkle some table salt on top of the spot. Add some soda water and scrub. Treating oven spills when they happen will help you avoid cleaning the whole oven as often. • Paste it on. If water and baking soda just aren’t cutting it, Lindsey says to try adding some concentrated dish soap and a half cup of kosher salt for those bigger cleaning tasks. Let the cleaner soak into the grease for a couple hours before removing it. Don’t be afraid to let this mixture sit overnight. A little elbow grease can go a long way but it isn’t necessary in this case, unless you’re short on time. Rinse the cleaner with warm water and spray distilled white vinegar on the area to get rid of the extra residue. By making a paste out of these ingredients, your oven is going to get a heck of a transformation and you won’t be subjecting the environment or yourself to those crazy chemicals. • Keep it simple. You can forget that harsh steel wool when using the right ingredients. Reach for a kitchen sponge or paintbrush before you try sanding off that burnt on food. Dip your utensil in warm water before rinsing off any cleaner. If you’re having a hard time with dense build-up, consider turning on the oven heat for some extra grime dissolving encouragement. • When life gives you lemons, clean the oven. You may already know that lemon juice is a great natural cleaning ingredient, but did you also know that cooking lemons in your oven can help clean it? Follow these simple directions for juicing two lemons and baking them at a low heat to help loosen buildup. • Do the window. Even commercial oven cleaners can often leave the oven window grimy and using the wrong material can scratch the glass. To get rid of that window fog, Lindsey suggests using the same cleaning paste and letting it sit long enough to attack that built up grease. Rinse the combination off the windows, before spraying it with vinegar, just like before. • Rack up the bathtub. Often racks can often be hard to clean. Even Lindsey admits to letting hers soak in the bathtub. Cover the racks in a thick layer of the cleaning paste for a couple hours before scrubbing your heart out. • Don’t forget the door. Your oven door absorbs a lot of fingerprints and cooking residue. Mix some vinegar and an equal amount of warm water in a spray bottle, and squirt it on the outside of your oven door. Polish with a soft cloth. Some all natural mixtures may need to be performed twice to achieve oven perfection, but that’s a small price to pay for a green solution. If you do choose to use a commercial oven cleaner, be sure to take some precautions to protect yourself and the environment. Use oven cleaners as infrequently possible, and always make sure the room is well ventilated when you do. Wear gloves and rinse away all residue completely from the oven’s interior so that it doesn’t transfer to food. Dispose of any remaining oven cleaner and the can safely, using a hazardous waste collection center or recycling site if your location has one.